Touring with a tiny house is an adventure! I’ll be giving an official dispatch with pictures and lessons learned. This post is long but informative, I’ll try to make them shorter and more often in the future. I just haven’t had the bandwidth or wifi to do so. I fulfilled my five year old dream on June 1st by taking the Silver Bullet Tiny House on its first tour*. Grit and gumption are words I would use to describe the character traits one must possess for a tiny house journey, its build, and a road tour. Attempting a cross-country tiny house sustainable lifestyle education tour at age 67, alone, was described by some friends and colleagues as “plumb crazy”. Well, you know what, I was up for the challenge. Before May, I had never driven a pick up truck, nor a trailer, nor a 10,000 pound load anywhere, much less on interstate highways. I have been to 49 of our 50 Unites States of America. Everywhere I go, I am used to meeting so many creative, amazing folks. This tour is not any different. With this 10,000 pound load and a case of the nerves, I stopped at every rest stop and turnpike plaza. As you can see from the pictures I met an older ford hotrod and another tiny dweller along the way. I passed through four states in lovely sunny weather. My first night I spent in a ginormous truck stop with 165 spaces. That night was so much fun meeting all the trucker couples carrying the country’s commerce on their backs.Being dyslexic, the thought of going in reverse scares me.Luckily, I have managed to always go forward. I really was not prepared for all the honking, filming and smartphone camera shots while I was driving and every time I stopped. Now I know what the rest of the tiny house tribe was talking about! I guess I’m going to have to comb my hair a tad more often. I headed to a location just outside Philadelphia for my first Pop-up Tour at a sponsor’s location; Benjamin Obdyke’s parking lot in Horsham PA. was spacious and well suited to meeting the hundred or so visitors we accommodated the next day from their company, the curious public and the Philadelphia meet-up groups. Hats off to the PB & J food vendor who delivered a lovely, gourmet dinner for me before I packed up. What is a building envelope and why was rain screen important in your bio-mimicry design? Can you really project livestreaming video with your projector on a window shade instead of having a TV? What are those cool awnings? What mixture and proportions are in your compost toilet? How come your grill and coffeepot can charge your phone and computer? A building envelope is the physical separator between the conditioned and unconditioned environment of a building including the resistance to air, water, heat, light, and noise transfer. Benjamin Obdyke’s rain screen is one important layered element of this design. Read more here. Yes, you can. When you are near WiFi, download your favorite shows, movies, etc. from Netflix, Xfinity or whomever, on your smartphone (this saves data charges). Project directly from your unit; mine is an HD Brookstone. I do this on my thick smooth bay window shade. I also have done this on the side of a barn! Or use your phone as a hotspot, if you have a good data plan. Those wicked cool awnings are a polycarbonate material I was introduced to years ago when helping Deek at one of his workshops. It is Tuftex. See me on the road or at the Tiny House Jamboree, August 5-7th in Colorado Springs (Vendor Booth #13- next to Onduline) and I’ll tell you all about it! I chose a clear panel so that weather deflects from my windows and yet I still have the benefit of light. They are very good for saving my windows from damage on the interstates as well. One part organic cedar chips and one part organic peat moss; mix together and put in a container. I also add my daily Hazelnut coffee grounds. My “bucket” has my own DIY urine diverter. I have used Biolite products for five years, since their early beginnings. I have their grille, their stove, the teapot, and their lights. And I love plugging in to recharge my tech components. Luckily I left early before the local festival closed off the streets surrounding me. Heading for the Christian Klay Vineyard for my next Pop-up Tour/Workshop certainly kept me on my toes. Checking my rear view mirror I saw my Tuftex side door flopping in and out. Stuff is going to happen out there, so have your power tools and extra pieces of wood and screws handy. I was back on the road in minutes. The Pennsylvania Turnpike has several low-clearance bridges and tunnels – that is, in the right lane several are only 13’2″. So keep your eyes open! For my last stretch, I should have been to my friend’s vineyard in a few hours. The weather was not cooperating in the mountains and so I went turnpike plaza to turnpike plaza waiting for the thunder, lightning and squalls to abate.I just hopped in my tiny, cracked a good book and relaxed. The Christian Klay Winery is beautiful upon approach, even in bad weather. The hundreds of acres of mountaintop vineyards, ponds and many barns have histories that only its charming vintner, Sharon Klay, can tell with flare and style as she drives you through her vineyard. Sharon and I met many decades ago when I was art professor in Pittsburgh, long before she fell into an award winning career as a vintner. She is also a painter and at one time was my student. This visit has allowed me to see the vineyard in its maturity and it is lovely. So many kinds of grapes and wines were seen and sampled. In the evenings after visiting Ohiopyle, the local art sanctuaries or the Frank Lloyd Wright house we return in the evening. I cook, she pours and expounds on the botanical infusion process that has produced some of her finest award winning wines. Of course, I’m in heaven. We also stopped by at her son’s distillery, Ridge Runner, across the street, where we created the Silver Bullet Tiny cocktail. Her lovely sister, Dr. McCarthy, has her own restaurant in a town at the bottom of the mountain with food to die for. become a guiltless gourmet and experience one of the finest farm to table destinations. My tiny house tours and workshops drew an interesting group: builder’s, junior and high school students, tiny house curious empty nesters and environmentalists. All were fascinated with my off-grid building envelope and customized repurposed/reclaimed storage solutions. Hooray, a success. You know you have an impact when science students can’t wait to take the samples of your building envelope back to their environmental science teachers and parents! When prepping for your tour, and making your tiny house on wheels road worthy, always have it weighed first and your anti-sway bars and brakes calibrated in several driving conditions. Against my trailer company owner’s advice back in 2013, I bought only a 7500lbGW trailer. For only $500. additional, I could have had a 10,000lbGW trailer. Oops! I should have listened to Ross. I weighed in at 9,280 pounds a few weeks before my trip. That cost me $1,300. to change out my axles, tires and brakes for the appropriate 10,000lbGW system. And it added 2″ to my height, which is 13’2″ now. Anti-sway bars, if not calibrated correctly, can cause more damage than their original intended purpose. Make sure wherever you purchased your trailer, they help do this for you. For me, I went with the trailer company owner to see just what is involved in a calibration of them and my new braking system. Take driving lessons with your load or practice beforehand. I white-knuckled it all the way in my first 500 miles of driving of the tiny house. Yikes, just learning how it feels to move from gear to gear, how to navigate those narrow construction lanes with high cement walls, how to quickly collapse your truck mirror when needed, how to brake effectively, etc. was kind of exciting. Knowing you have a 10,000 lb load behind you down a steep mountain is a new experience. When my first large semi-tractortrailer passed me on the left, I could feel the physics of the pull of my vehicle mass towards his. I call it the semi vortex adjustment. When two of them are simultaneously on either side of me I call that the semi-sandwich vortex adjustment. It feels similar to the feeling you get when an elevator drops ten floors too fast. Learn to drive forward only until you know how to back up with your tiny house. After my first day of driving I was physically exhausted. My hands and arms and right foot ached. It takes awhile to learn how, when and in what conditions and gears give you the safest, most comfortable and angst-free ride. That first night, I saw a gigantic truck stop with 165 spots to park and a path forward to exit. As one of the nation’s largest truck stops, which is an education in our country’s commerce, I pulled in next to militia shipments, stacked armored vehicles, loads of bicycles, food, building materials, you name it! The management gave me a free shower because I was the first ‘tiny house’ they had ever seen. Or maybe the stench of nervous driving was just a bit too much for them! LOL. I had a few hours of drinking my favorite wine outside on the chair and watched the experts ‘backing in’ to their spot from every conceivable beginning position. I learned a lot! Truckers loved my tiny, and they showed me some of their incredibly elaborate cab living spaces. I had some great conversations with trucker couples and drivers – real salt of the earth folks. Too scared to get stuck backing up, I made sure every place I went I saw the path forward to get out before I entered. Be diligent about checking bridge and underpass heights; yes, even on interstates. On the Pennsylvania Turnpike there are several old tunnels, bridges and overpasses. They are pretty good about giving you notice about 50 yards in advance. Other times, it is just a 6″x 10″ sign on the bridge. Be prepared to move over into the middle lane every time you see an arched bridge or tunnel. Getting off the interstate to get gas or food can also be tricky. Heights and the space to turn should be something you assess before turning in. Do not risk driving your precious load in bad weather. I had forgotten how dangerous the mountain road was up to the winery at Chalk Hill. I started up the mountain with no rain, then it began pouring. I could see each turn-off area was occupied by several trucks with no place for me to stop. The last third up to Summit Hill was in dense fog. With no place to turn off and traffic behind me, I white knuckled my way to the top. I DO NOT recommend driving your tiny house in this kind of weather, especially up a dangerous mountain. I’ve been up and down the mountain many times since then. On this mountain it is illegal to go down the mountain going anymore than 10 miles an hour. And that is enforced daily. Oh yeah, I’ll make sure its dry and sunny out when I leave! Take the time to rest, get out and enjoy the nature and unique places near you along the way. If you know my life story, you know I have had several close calls with death, Life is short, don’t forget to smell the roses, hike the mountains, share lovingly prepared meals with friends, dance and drink great wines. Being compassionate to others and caring for yourself is not an oxymoron. Giving that extra moment at the end of the day after hordes of tourists see your tiny to a curious wide-eyed child who has so many questions. Inviting a less fortunate ‘tiny house curious’ stranger to share a meal and their story with you inside your tiny. And also remembering to take time for yourself while you serve, educate and empower the public about your tiny house journey and the movement. For me, that means meditating or practicing yoga at sunrise or sunset. Or sharing wine and food with tiny house friends at a long table in the farm fields. Perhaps sketching and letting my imagination run free or just curling up with a good book listening to the rain on steel. I look forward to every day of this adventure: the experiences, lessons, insights and people that await me on this journey will be one I will never forget! *I have always followed my dreams. I have been lucky to have had 3 successful stints in very different right and left hemisphere careers. I’m living my fourth intentional lifestyle design and am having the fun, joy and rewarding experience of facilitating and empowering others to do the same. I have given sustainable lifestyle design classes and workshops, hands-on tiny house workshops, tiny house journey seminars, facilitated and helped other tiny house leaders in their workshops, spoken locally, regionally and nationally for over four years, and I love it! Last week I had the distinct pleasure of presenting a brief history of the tiny house movement and speak about my Silver Bullet tiny house journey/build to a group that convenes monthly called Local Poverty Matters. I spoke about my moral imperative of solving climate change, the desperate lack of affordable housing, and my homelessness as a single human in a world of diminishing resources. Most of the homeless, like me, do not want a hand-out. We want a hand-up. After being socially ostracized, discounted and marginalized, we are often invisible to other Americans. The American Dream I grew up with is dead. So I invented and chose a new American Dream. I created the Silver Bullet Tiny House Challenge. Could I build a non-toxic, off-grid, all renewable energy fed, resilient sustainable lifestyle in a mobile tiny house on wheels? Could it be made of reclaimed, repurposed sustainable materials and cost less than $20,000.? Could it serve as a mobile educational exhibit that could inspire individuals and families to decrease their carbon footprint, their economic costs and improve their community involvement by freeing up more time and control of their lives? Taking my future in my own hands, I designed a beautiful, biomimetic tiny house that nurtures my sustainable lifestyle. I used reclaimed resources, found sponsors, repurposed what others left on the roadside, and made my own home. Nature is never more than four feet away from me in any direction. I love that. The details of my story and build are in my recently released e-Book, if you want to know more. Proceeds from the book support me giving workshops on sustainable living across the USA starting in Spring, 2016. Here’s the thing about my homelessness. Deciding to take my own fate in my own hands, even with obstacles like my disabilities*, my poor health, no funds, no social or career possibilities imminent, fostered within me a resilience I only fantasized was possible. That is, until I achieved my solution. Creating my own hand-up was not easy; however, others were inspired by my passion, drive and commitment to live a simple, tiny, healthier, zero-waste footprint lifestyle and they helped me any way they could. I gained self-esteem, construction skills galore, lost weight, grew muscle (both physically and psychologically), found my “happy place” and finally, I gained social and community acceptance. The journey was incredibly challenging with many turning points in which I almost quit. But like all great journeys and projects, when finished, the joy and glory of seeing my accomplishment, knowing I reached all my goals, was an amazing reward. I have achieved wellness all around. I will live in a non-toxic, all renewable energy, self bio-mimetically designed, hand-built, mobile home. That’s why “tiny” and that’s why “now”. You can donate here. Every dollar helps me to help others. * Although I have been classified by the State of Massachusetts as disabled, I have never collected any disability income from any source, private or public, Federal or State. Nov. 4, 2015 Keynote Speaker for “Poverty Matters” Study Group, Newburyport, MA. Vera will be speaking about her personal Silver Bullet challenge and the journey to meet the goal she set out for herself in 2010. She will connect the dots for the study group by examining how the tiny house movement is not only the sustainability imperative at work but also a solution to global warming and the affordable housing crisis. November 14th, 2015, 12 – 4 PM – Newbury, MA. $75. *** Sign up now, before it sells out!!! Meet a local tiny house designer/builder and learn more about her tiny house journey and the tiny house movement. Tour the Silver Bullet Tiny House on wheels and discover all its reclaimed, recycled, non-toxic, sustainable and net-zero waste building materials and systems. How to transition into a sustainable lifestyle will be discussed with practical tips on how to reduce your carbon footprint quickly. “If your longing to live the tiny life I highly recommend attending Vera’s workshop as a first step. 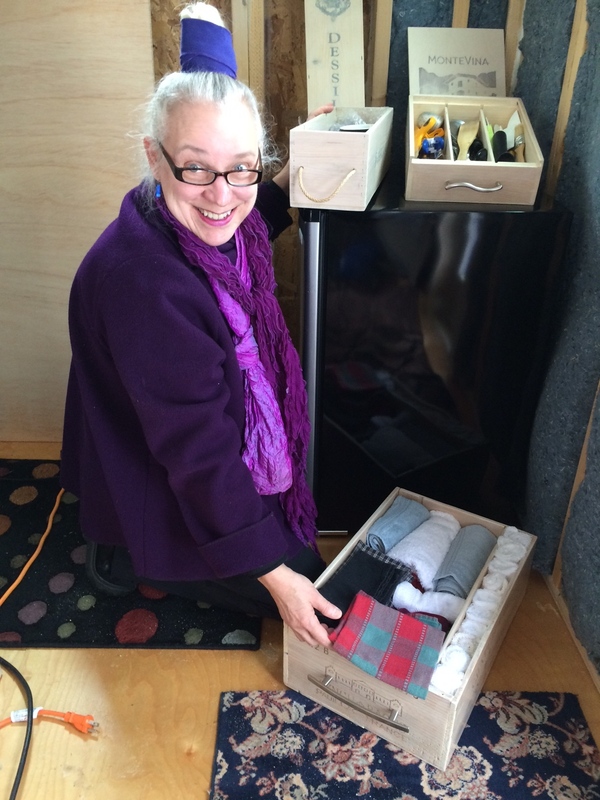 Not only will you get to see, touch, and feel an actual tiny house but Vera will share with you her story, her experiences, and knowledge gained by extensive research and trial and error. 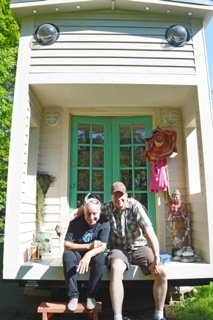 I left her workshop with a bigger appreciation for the Tiny house way of life and for the movement as a whole. I now have a better understanding of the social, economic, environmental, and cultural effects this intentional way of living supports and impacts. So inspired to start my THOW journey real soon! ” Sophie T.
“I also really enjoyed all the sustainability information that you shared with us. We are definitely starting to see a trend in people who we talk to: those who are environmentally conscious, and those who are financially conscious. I love that your nonprofit strives to show people that they can have both.” Megan M.
“I definitely learned a lot about how tiny houses are constructed, and providing us with some of the building materials you used was incredibly useful. The game we played at the end of the tour also really helped put everything into perspective – it was definitely a great learning process when we wrote down the top 5 things we should consider before building a tiny house.” Jay W.
“I greatly appreciate your willingness to open up your home and heart to us and share with us your values as well as your challenges.” Mika IW. Trailer modification, design process, framing, sheathing, downsizing transitions, insulation and energy systems will be covered. Includes light refreshments, building samples and 30 minute Q&A session. Bring your sense of humor!! To Register click PayPal button below and we will email you instructions and directions. Deek’s video of the Silver Bullet Tiny House he made last month here. ***All proceeds go to support sustainability education at www.terrabluteams.org. There are two fully paid scholarships to this workshop available to those in need. To apply, please email taospirit@mac.com with a paragraph about your need and reason for attending. Include contact information & phone. Applications processed within 24 hours. Our 8th Workshop! Class # 208 The Tiny House Journey – Newbury, MA. Saturday, 7/18/2015, 12 – 4 PM $75. *** Sign up now, before it sells out!!! Meet a local tiny house designer/builder and learn more about her tiny house journey and the tiny house movement. Tour the Silver Bullet Tiny House on wheels (NOW COMPLETED) and discover all its reclaimed, recycled, non-toxic, sustainable and net-zero waste building materials and systems. How to transition into a sustainable lifestyle will be discussed with practical tips on how to reduce your carbon footprint quickly. 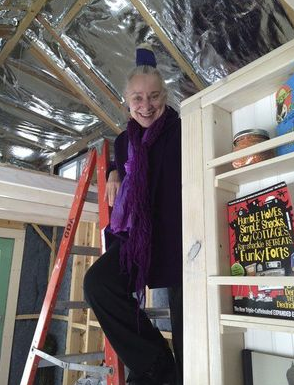 Author Elizabeth Rose’s article on Vera’s tiny house in the Newburyport Daily News, click here. I’m so glad to be back in the Silver Bullet finishing my interior. It has been a busy two months at sustainability fairs, festivals, speaking engagements and workshops. I have intentfully held back on putting up all the interior pictures because I am about to finish this two year project in a few weeks. YAY! Many of you know how all-consuming this kind of DIY build can be and I look forward to having the time, freedom and luxury of putting my feet up on my tiny house deck and updating all my websites, relaxing and hiking in nature and tending to the organic garden. Just a few more weeks of full-on 24-7 building and ethically placing 2500 of my last remaining 3000 possessions, (Oh yes, I was a bean counter -CPA in a former life), and I finally move in! I have recycled, repurposed, free cycled, sold, given away just about every piece of art gallery equipment, flat files, print racks, clothing, furniture, gifts and dishes I accumulated over my 65 years. (Used Craig’s List, yerdle, Freecycle, decluttr, Todd’s Farm, and thread up) I started this journey five years ago with 213,452 possessions from my art gallery, art studio, home and rental unit. It takes a bit longer to move through layers of emotive, personal, and career history. And even longer to downsize your resources ethically, making sure none of them end up in a landfill. Derek Diedricksen of Relaxshacks has promised to come film the finished tiny house this summer. When I attended his workshop, way back in 2012, I told him about my dream to have a traveling “sustainable lifestyle” exhibit to tour the country. After starting my sustainable education non-profit, terrabluteams.org, in 2011, he was the person (besides my daughter) who encouraged me past the “Tipping Point” to move forward with my dream. In a few weeks, it will be realized. My gratitude goes out to Deek, my daughter, all the volunteers, sponsors, IndieGoGo donors, tiny house community members, friends and relatives who gave me emotional, moral, fiscal and physical support during this challenging, sometimes harrowing, amazing and totally rewarding journey. “Living the Sustainable Tiny Life”, a book about Vera’s journey, is soon to be published. Join her in Colorado Springs this August for the Tiny House Jamboree, where she will be speaking. Keep checking back for the Silver Bullet Open House Party to get the tour underway!